Home Celebration Ideas Monday Celebration Tips: How to Host the Spookiest Halloween Party! Invite the boys and ghouls! Before you can have a spooky good time, you need to give guests enough advance notice that they can plan to attend. Depending on whether you’re including little “goblins” or just adult monsters, you’ll want to pin down your list and get the word out. Create an event on Facebook to let everyone know, or drop invites in the mail. Don’t forget to mention that Halloween costumes are a MUST! Now get working on your own costume! This is the one day you can be whoever you want, so be creative and have some fun! Let your alter-ego run wild! Hit the Halloween or DIY store and stock up on creepy decorations! Since it’s Halloween, it’s always fun to continue the theme throughout the party space. Start with ghoulish basics like spider webs, bats, skeletons, zombies, and more! If you are looking for some Spooktacular Halloween Ideas, you can visit our Pinterest page for some scary good inspiration! Once your home is eerily transformed, you’ll need some music to back it up! Whether you create your own playlist or find a free one online, make sure it features some Halloween classics! Think Michael Jackson’s “Thriller”, the “Monster Mash” by Bobby Pickett, “This is Halloween” from the Nightmare Before Christmas, and “Superstition” by Stevie Wonder, just to name a few. Make sure your goblins have plenty to gobble! Keep with the theme and make some scary good food for them to enjoy! Try some “mummy dogs,” a “zombie buffet,” or some “spider deviled eggs.” For more delicious food ideas, check out our Pinterest page! End your Halloween bash with a fresh sweet treat! No matter what the size of your party, we have Halloween creations to please every beast! Need a WOW centerpiece that will feed the whole crew? Order our Best for Halloween Parties! Bootastic Festival™ Dipped Strawberries & Swizzle Bananas! 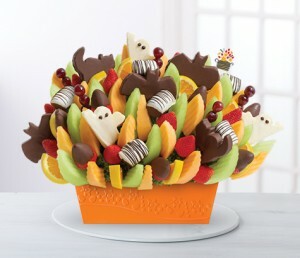 With ghost-shaped pineapple dipped in white chocolate, bat-shaped pineapple and cat-shaped pineapple dipped in semisweet chocolate, this arrangement will send all your party guests home with Jack-o-lantern size smiles. It’s spooktacular stuff! Previous articleMonday Celebration Tips: How to rally a team to join in a Breast Cancer Awareness Event! Next articleMonday Celebration Tips: How to be the Hostess with the Mostess!